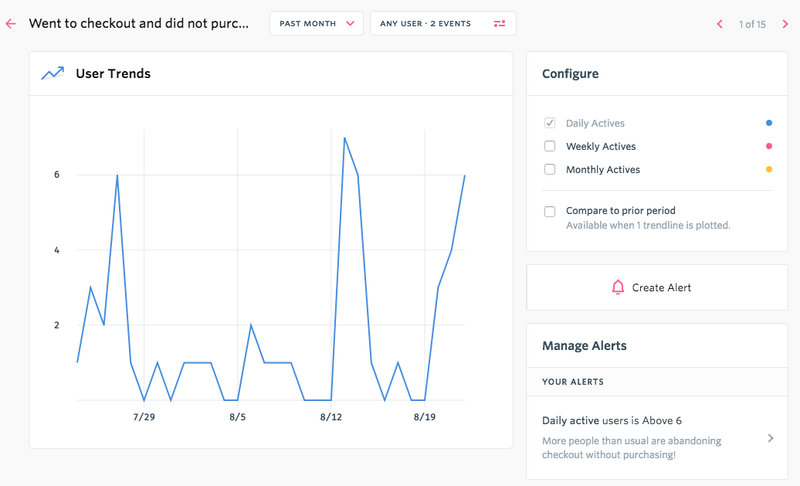 Alerts is an add-on feature initially available for a limited number of FullStory accounts. 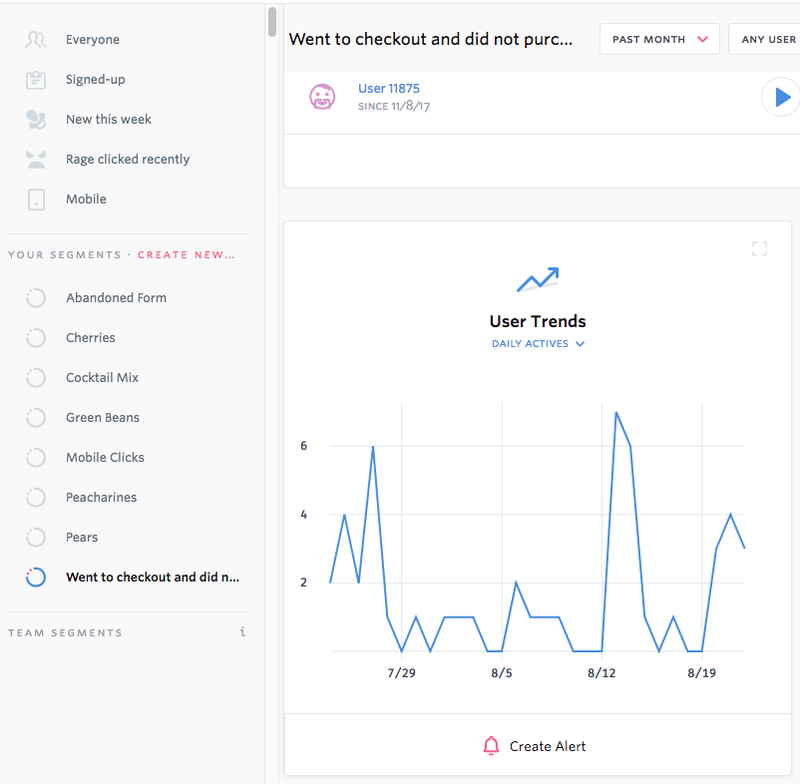 We will be making this feature more widely available in the future and will update this article with more information on how you can use alerts. What is a 24 hour rolling window? 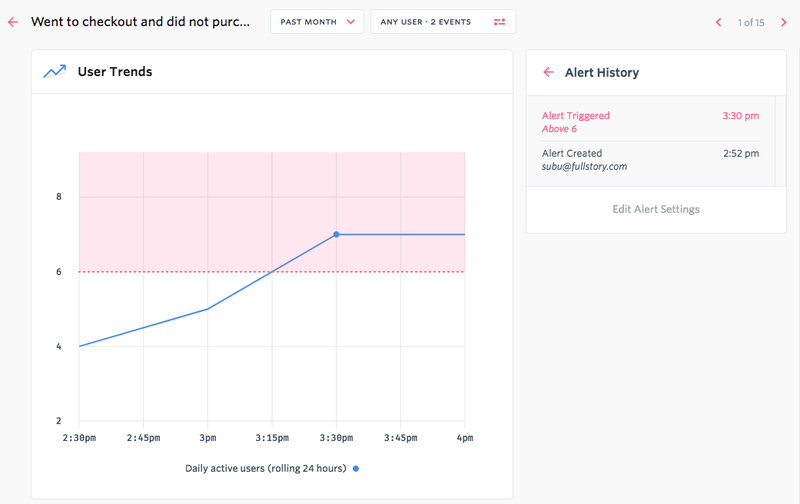 Alerts from FullStory help you know if your users are succeeding or struggling--even when you aren’t logged in to FullStory. FullStory gives you visibility into how your users are engaging with your website. You already save interactions you care about as Segments. Now Alerts from FullStory will help you know how those segments are performing. Is there an increase or decrease in the number of successful purchases on my checkout page? 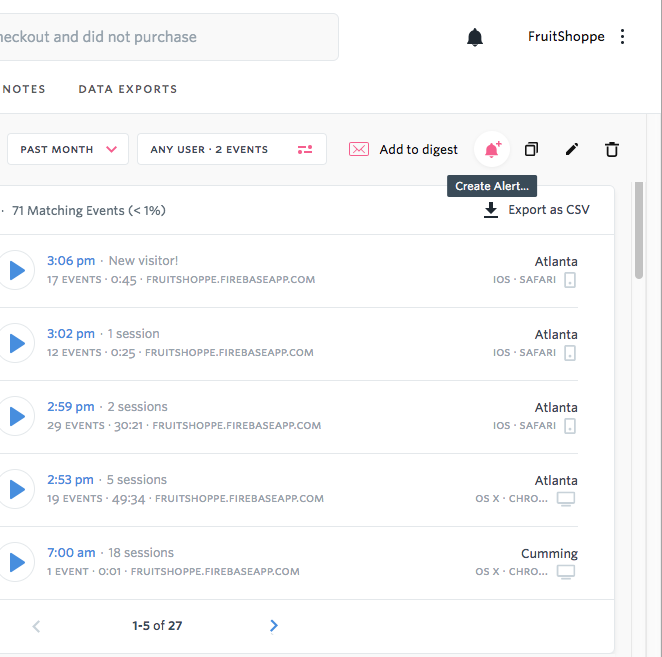 We just launched a new feature, are we seeing any increases in funnel completion or engagement? I want to know if the number of rage clicks is increasing on my site. I want to be alerted if more people than usual have a first meaningful paint time greater than 5 seconds on mobile. Save a segment that you'd like to keep tabs on. You can set alerts on the number of users in that segment. 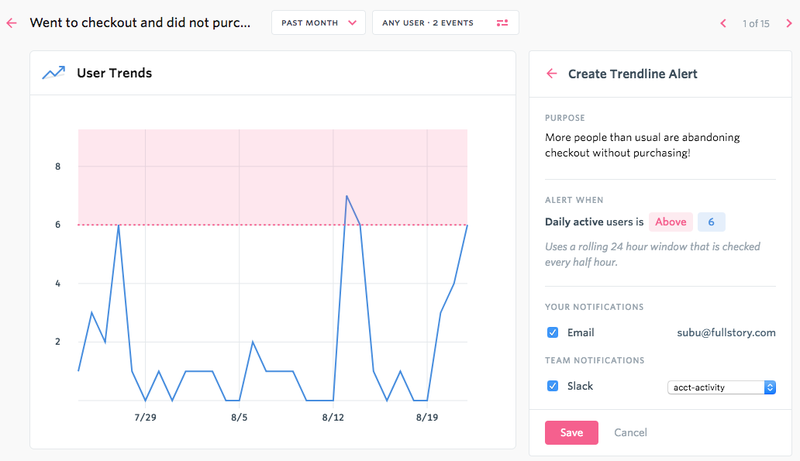 Create an alert for that segment by choosing a threshold number - you will be notified when the number of users goes above or below the threshold number you set. Create a description for your alert and decide if you'd like to be notified by Slack or email. Save and then go about your work, and FullStory will notify you when your threshold number is passed! Choose a saved segment OR create a new segment that you want to be alerted on. You can get to alerts in a few different ways. 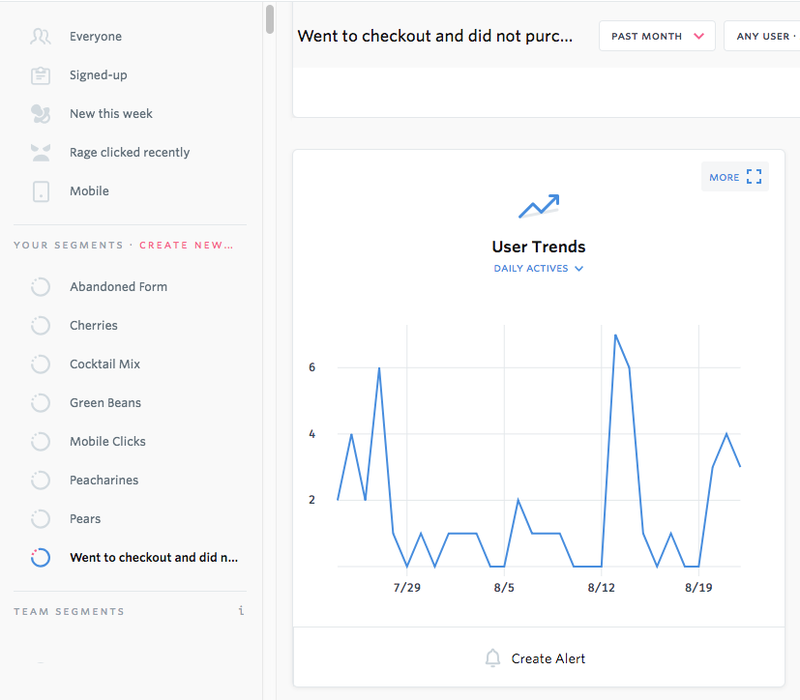 Scroll down to the User Trend searchie and click “Create Alert” or "Manage Alerts". Click on "MORE " at the top of the User Trends searchie to see more options! You can alert on daily, weekly, and monthly actives. You can also compare to a prior period. Choose which view you’d like to be alerted on, and click “Create Alert”. When you receive an alert, you'll see the segment name associated with the alert. To help provide extra context--and know how to respond-- you can add a description (“Purpose”). This will remind you what to do when this alert is triggered. For instance, if you create an alert for rage clicks the description might read "Uh oh, looks like we have a problem with Rage Clicks. Let's see what's confusing!" Toggle Above and Below options according to your preference for the alert. Type or select the threshold value at which you would like an alert to be triggered. When the threshold you have chosen is crossed, we will check and send you an alert within ~30-60 minutes. See "Special Considerations" below for more details on how the magic happens. If you have a Slack integration with FullStory, you can choose a channel to receive notifications, otherwise you'll receive alerts to your email. Click “Save” to finalize the setting. Upon being alerted, you can enter FullStory and view the history of the alert and see every time it has fired. You can find all of the alerts that you have created by clicking the the bell icon in the top right corner of the page. A pink badge indicates that you have new alerts to view. 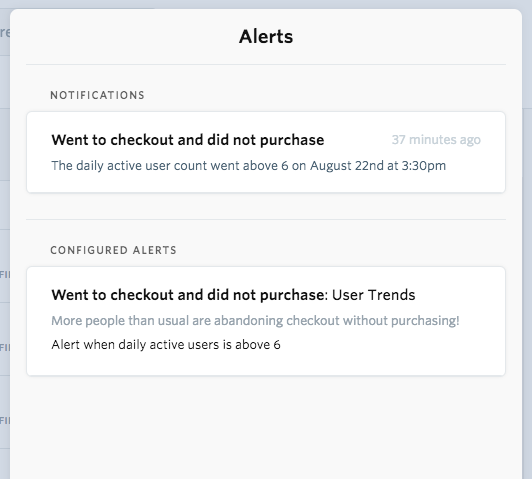 After clicking the bell, you’ll receive a menu of your configured alerts, and see any recently triggered alert notifications at the top of the menu. Currently, you cannot choose a list of your teammates to also receive an alert you have set. However, you can share your alerts with your team, and then your teammates can choose to subscribe if they want. While in the expanded alerts view, copy the URL string from the browser bar and send it to your teammate. Upon clicking on the URL, your teammate will be prompted to login to FullStory and will land in this view. They simply need to click the pink “Subscribe to this Alert” button. In any segment, if an alert is already configured, the prompt below the User Trends searchie will read “Manage Alerts” instead of “Create Alert.” Click on “Manage Alerts” to view and subscribe. Alternatively, ask your teammate to send the URL of the alert so you can subscribe. The threshold is a "greater than" or "less than" line, not "greater than or equal to" or "less than or equal to". Example: If 0 people have been on my new page and I want to be alerted of the first visitor, my alert should be "above 0", not "above 1". FullStory won't notify you continuously when the value is over/below your threshold, but just notify you when the threshold is crossed. So the value will have to dip back down/go back over the threshold to trigger the alert again. Alert will only fire on the occurrences when the line crosses from 0 to 1. It could take up to 1 hour for an alert to fire. Every half hour, we compute the active user count over the last 24 hours to see if events occurred. It can additionally take 15-30 minutes for an event to get indexed. Example: So if the triggering event occurs at 9:00 am, it could take up until 10:00 AM for the alert to fire (indexing time, plus up to 30 minutes to wait for the alert check). Typically at FullStory, we show you “daily active users who fit your segment” during the 24 hours between midnight-midnight. For alerts, if we used the standard fixed midnight-midnight time window, we would only be able to send you notifications about your segments right at midnight, or the next morning. However, we really wanted to be able to notify you about your customer experience as close to realtime as we could. It didn't feel helpful to make you wait until 9 am the next day to find out that your site is broken. So for alerts notifications, we’ve implemented a “rolling 24 hour window” where we look at the past 24 hours to know when to alert you. This means that you will see the User Trends graph (which will only show you the last value from midnight the night before), but when you get a notification, we’ll zoom in and show you the last 24 hours, which won’t necessarily match up exactly with the User Trends graph. Please let us know at support@fullstory.com! 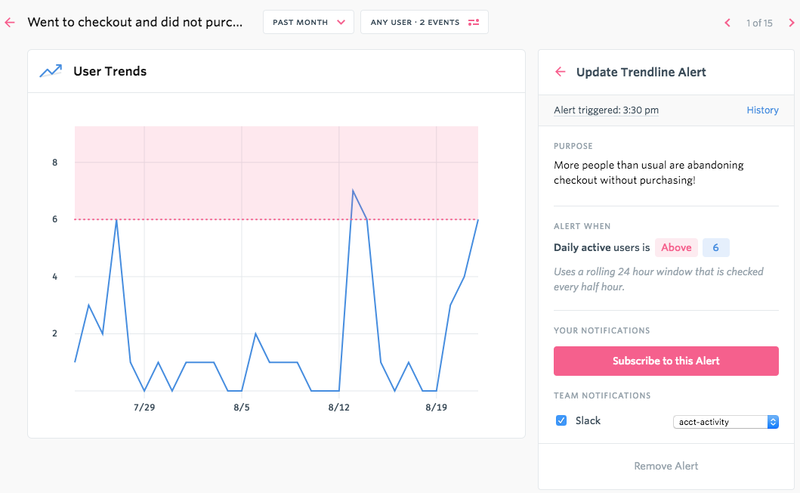 Alerts is available for a limited number of accounts at this time, but we will be updating you on future plans and how alerts can be available to your organization in the future.